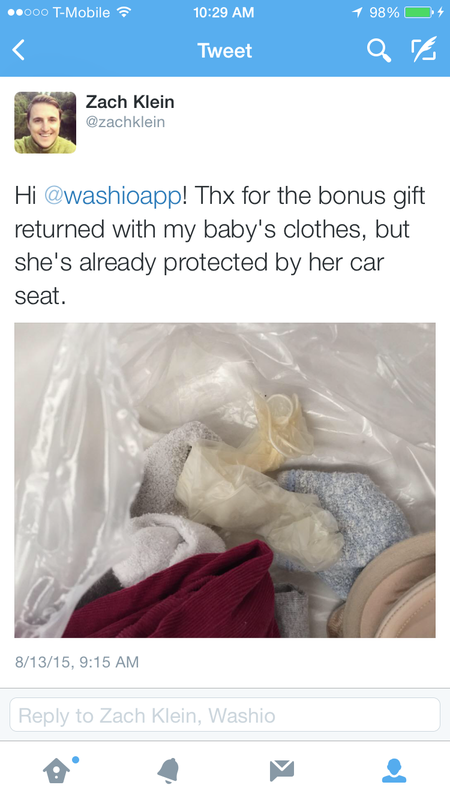 Vimeo co-founder Zach Klein tweeted this morning that he’d found what looked like a used condom in a freshly cleaned bag of baby clothes from laundry startup Washio. The idea that Washio laundry personnel were up to some hanky-panky while taking care of customers’ clothes was enough to gross quite a few people out. I even tweeted out to Washio to ask what was going on. Washio still hasn’t tweeted back. The condom in question might have been a latex glove left behind from one of the workers. Washio team members wear latex gloves to protect themselves and the integrity of our customer’s clothing. A photograph shared online by a Washio customer appears to show one of these gloves inside a bag of his laundry. We are certain this was an isolated incident and have taken all appropriate measures to assure it does not happen again. We regret the error and assure all Washio customers that safety, hygiene and quality are our top priority. Klein told TechCrunch that he now thinks the rubber object in his baby’s laundry bag may have been a latex glove instead. “Some doubts were raised that it was a condom,” Klein said. Washio did not initially reach out to TechCrunch, but did send the above statement after publication of this article. Washio also privately reached out to Klein and told him the object was a glove. However, Klein still isn’t sure that’s what it was. “I thought it was a used condom. I didn’t want to get anywhere near it. I walked it over in the laundry bag it came in and threw it out,” he told TechCrunch in an email. Washio has yet to get back to us after several attempts to get comment about the incident. Washio sent a statement about the incident. Washio has not answered other Twitter users about other incidents, either. @mf_stumbles took the company to task on Twitter this last week for ruining his laundry twice. Several tweets from the same Twitter user a day later didn’t seem to help. “@WashioApp you still hid every tweet about the articles you ruined. Sack up,” @mf_stumbles wrote. Washio told TechCrunch the tweet to @mf_stumbles was a reference to today’s incident and not a separate glove in bag incident.